I continue to field a lot of questions about efficiency (especially on the Brew-Magic) and I thought I would try to clear up a few myths, and give some practical advice. While this is generally applicable to any brewing style, I am going to focus on the Brew-Magic V350MS to give new users some starting points. I am also a BeerSmith user so will try to provide tips for setting up the application. A copy of my Equipment Profile can be downloaded in the files section of the Brew-Magic Owners page on Facebook. I first need to express my frustration with brewers chasing very high rates of efficiency. It has become, in some ways, a bragging right. The reality is that your efficiency will vary, and few brewers really understand how to calculate correctly. Efficiency is a measure of consistency, and not a measure of quality, the brewer or the final beer. Generally beginners will experience lower efficiency, which will rise and stabilize with more experience and careful processing. If you want a more in-depth understanding of efficiency, I would start with Palmer and Brewer’s Friend. 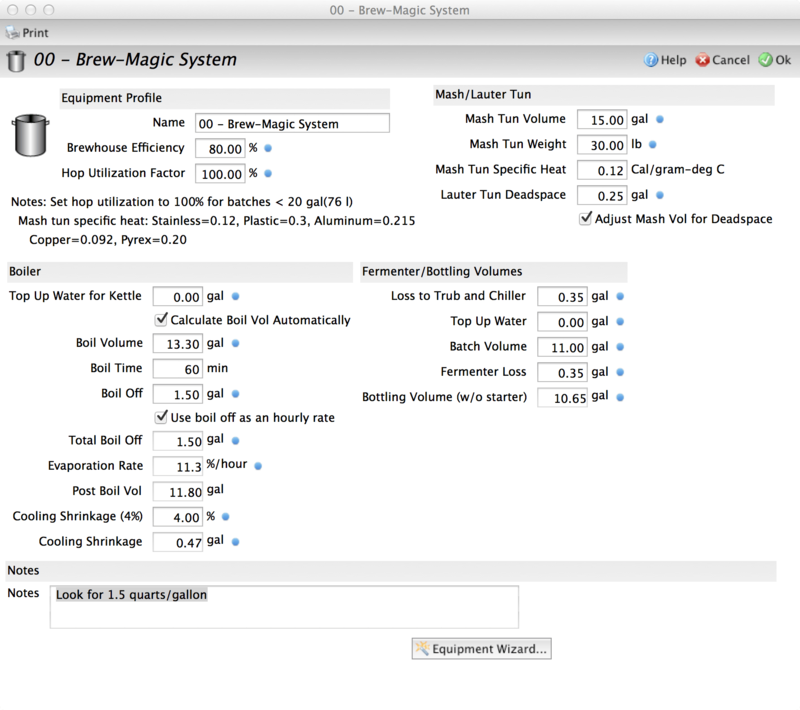 Dialing in Brewhouse efficiency on the Brew-Magic is not all that difficult, but takes some time. I struggled for a couple of years accepting efficiency that bounced between 65% and 75% until I took control and carefully measured everything. Remember that in hunting down an issue, you should change only one element before testing again… and I didn’t have the patience. Also – while the folks at Brew Magic intend to provide accurate calibration, it’s your responsibility to look at the system critically. What are the differences between Brewhouse and Extract Efficiency? Extract is simply a measure actual extract (gravity) of wort against the potential extract of the grist. Brewhouse efficiency incorporates extract efficiency against the volume losses of your system. Technically – it also incorporates losses in fermentation from trub, yeast and gravity checks. The calculation is complex, and sometimes variable due to errors or accidents. For the sake of this article, we are going to talk about Extract Efficiency, and possible areas of lost volume with the Brew Magic. So what affects Extract Efficiency? This all starts with the malt. 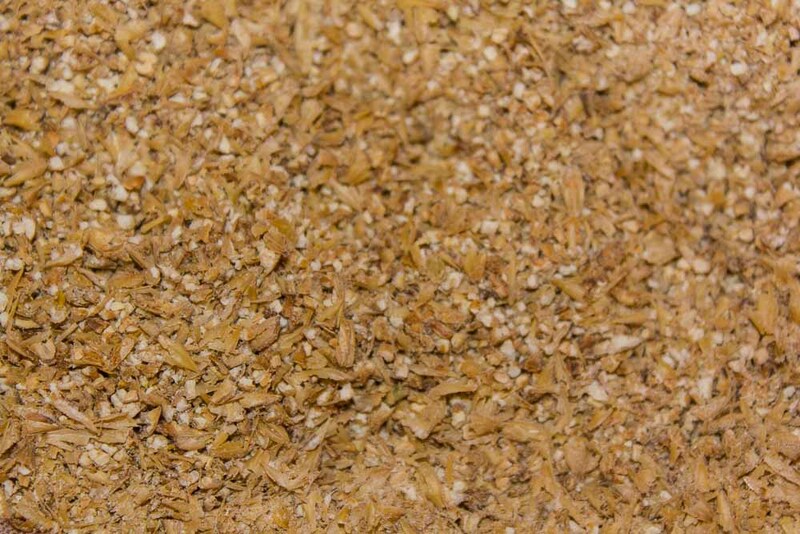 Old, stale malt will not convert properly and should be discarded. Always use fresh malt when possible and use milled malt as quickly as possible. Recipe is also important. You need enough diastatic power in your base malts to handle any specialty and adjuncts that you expect to contribute extract. Probably the largest issue that affects efficiency is the malt crush. There is a compromise that must be made between the crush size and the ability to lauter the mash easily. This compromise is critical when using a RIMS system like the Brew-Magic where liquor must recirculate through the mash bed. This recirculation action offsets much of the need to crush fine. Your mash and sparge technique will also influence how fine you mill; BIAB brewers can crush fairly fine, where cooler tun users may use a more moderate crush. With the Brew Magic, we are using a moderate to large crush. A starting point for V350 users is between 0.040 and 0.050, but that should be adjusted to provide a proper crush for the malt you are using. I find that the fatter kernels of Crisp Maris Otter crush well at 0.045, but I need to reduce to 0.040 for Briess 2-Row. For more details, check out Beer and Wine Journal. Your goal should be to remove the husks of the malt intact, while breaking the white endosperm into small parts and generate as little flour as possible. There is an article with pictures at homebrewtalk.com and great pictures at Brewer’s Friend. So crush a little, evaluate the crush and make adjustments as necessary. If your mill gap moves while crushing, stop periodically and check the gap. I never reduce my gap below 0.040 on my 2-roller mill, and will re-mill the grist if I see a lot of whole kernels rather than further reducing the gap. Mash Temperature and mash pH also impact efficiency, optimizing enzyme activity within specific temperature steps between 5.2 and 5.6 mash pH (measured at room temperature). Generally lower mash temperatures encourage a more fermentable wort, where higher mash temperature results in a less fermentable wort. While the mash temperatures generally don’t affect gravity, I find that a Mash Out temperature step at 170F aids lautering. Lautering technique can dramatically impact efficiency on a system like the Brew Magic. I have switched from batch sparge to a long and slow traditional sparge. Brew-Magic was designed for hybrid fly sparge, and I have gained nearly 10 points of extract efficiency with the technique. It takes some time and attention to match pump input and wort run off to the kettle, but is worth mastering. Use a calibrated pitcher to fill the HLT. I used the opportunity to create a story stick with gallon increments. You should note any differences in levels on the sight glass, if any. Remember the tank has no false bottom, so the graduations will vary to the boil kettle (the older configuration) and MLT. I tend to set the stick right at the inlet to the dip tube. Next, with the false bottom removed from the MLT, bottom fill the mash tun until the water level just touches the bottom of the dip tube. Stop the flow with the HLT valve. Using your handy graduated pitcher, empty the plumbing through the dump valve and measure that volume. That volume (about a quart in my case) needs to be accounted as Lauter Tun Deadspace in your Beer Smith equipment profile. Now perform the same volume calibration for the boil kettle. Install the dip tube but leave out the false bottom if you have that configuration, or set the newer dip tube to your preferred level. I find it is useful to fill it to the 15 gallon mark. Check your levels against the sight tube. Note the volume you have in the kettle and drain it, using gravity or your Chill Wizard. You need to measure the volume drained, and the resulting difference is added as Loss to Trub and Chiller. Anytime that you change your hoses (a discussion for another day), you should retest for volume losses. If you want to graduate your story stick for the BK, make sure the kettle is setup for brewing (with the false bottom if you use it). You can use the same water for a conical or Sabco fermenter, determining the volume left under the racking arm, if you have one. With a carboy, I would fill till I reached my normal trub level, and measure that amount. These volumes go into the Fermenter Loss field. I normally add at least 12 additional ounces for hydrometer readings. Finally, fill the boil kettle to 3-5 gallons using your graduated pitcher. Bring this to a boil, with the same vigor you boil wort. Start a timer at boil and go for exactly 60 minutes. Then cool the wort and measure the remains. Measure the remaining amount, adding back in the leavings in the boil kettle. The difference from the original volume and the remaining volume should give a boil off rate. This is consistent and not dependent on the total boil volume. That is your Boil Off Rate for your equipment profile. Make sure to check the box. 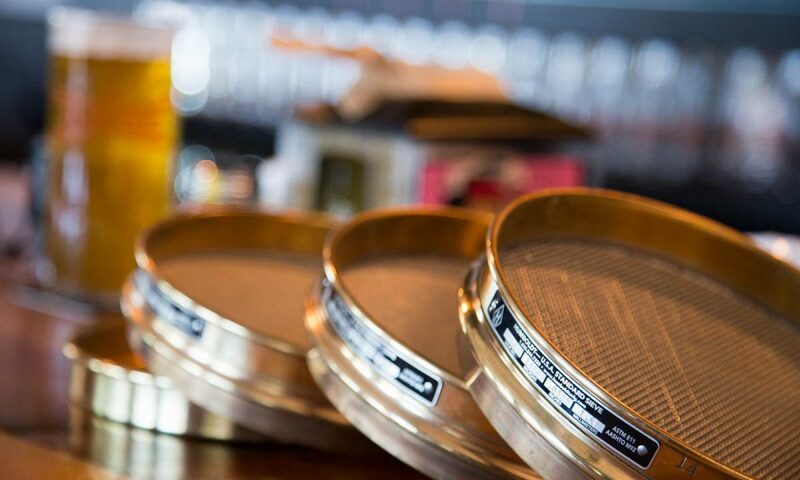 At this point, Beer-Smith should be setup to help you plan a recipe and brew day. As you brew, keep notes and statistics on your Brew House efficiency. You can adjust as you go, but I find it safer to only make a change after 3 consecutive brews. There seem to be many approaches and personalities that brew – some that throw caution to the wind and those on the other extreme that are extremely careful and have an engineer’s approach. I tend to fall into the latter, but feel that my brewing has leapt forward dramatically as a result. As I do these measurements, my focus is tightens on replicating previous brews, techniques and quality. The Brew-Magic is fun to brew on, but taking a few hours to carefully understand what is happening, and translating this into your chosen tools and procedures should give you confidence moving forward!